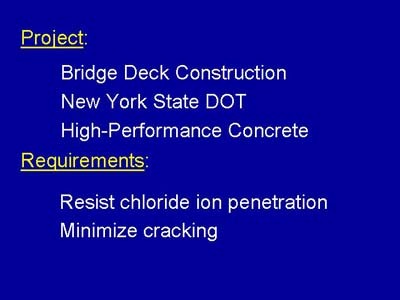 The requirements shown are typical for bridge deck construction. New York's approach to meeting these requirements is somewhat different from that of other states. Effective in April, 1999, NYSDOT adopted a "high-performance concrete" (Class HP) for all bridge decks after using the mixture for several years previously.